Seeing as this blog is situated on an employment law firm’s website, it’s made ample mention of the Employment Standards Act (ESA) over the years. The ESA is one of Ontario’s most significant pieces of employment legislation. The Act sets out employees’ rights and employers’ responsibilities in the workplace. It also sets standards for things like minimum wage and overtime pay. You don’t have to be an Ontario resident or even a Canadian citizen or permanent resident to be entitled to all of the ESA’s protections, rules and regulations. You are even entitled to all of the ESA’s protections if you don’t have a valid permit to work in Canada. 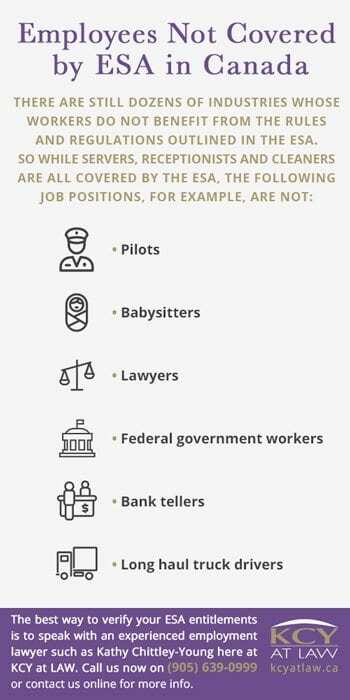 Indeed, most Ontario workers are covered by the ESA’s legislation. 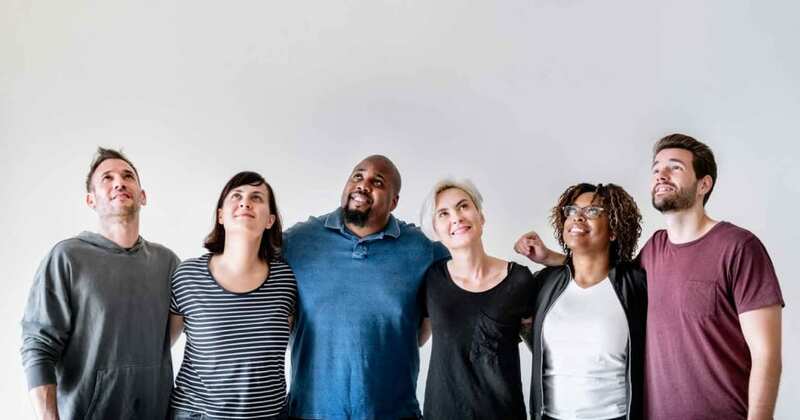 Instead, employees in the above jobs may be regulated by other legislation such as the Ontario Labour Relations Act or the Canada Labour Code. Such sectors include airlines, banks, post offices, radio and television stations and the federal civil service. Employees in these sectors are covered by laws made by the Canadian government, such as the Canada Labour Code, which apply all across Canada. The Canada Labour Code also applies if you hold political, judicial, religious or elected trade union office. This applies to you if you are working under a program that has been approved by a university or college of applied arts and technology or if you are a secondary school student performing work under a program authorized by your school board. 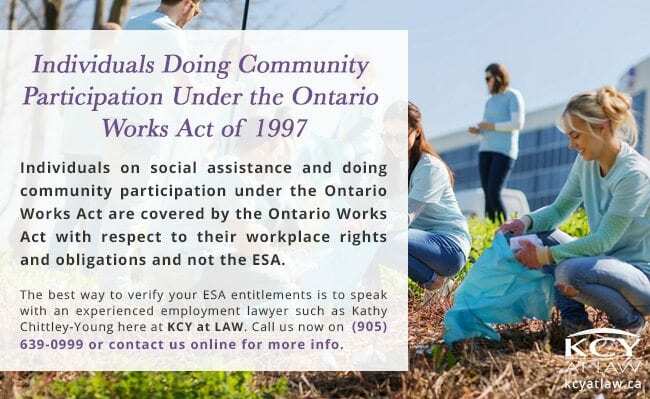 Individuals on social assistance and doing community participation under the Ontario Works Act are covered by the Ontario Works Act with respect to their workplace rights and obligations and not the ESA. Police officers’ employment rights are detailed in the Police Services Act. Employers have occasionally tried to claim that their workers are self-employed and that the ESA therefore doesn’t apply. But this is often inaccurate. Even if you signed a contract saying that you are an ‘independent contractor’ you may still be entitled to ESA protections. 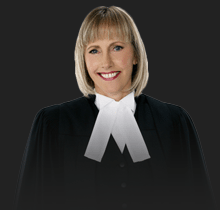 The best way to verify your ESA entitlements is to speak with an experienced employment lawyer such as Kathy Chittley-Young here at KCY at LAW. (905) 639-0999 or fill out a form online here.